Last year, in December, Margaret Cobleigh sent me her rendition of a beautiful embroidery design for a bunch of carnations. Well, just recently, she finished embroidering the design herself, and has graciously allowed me to share photos of it with you. Reminiscent of the “Society Silk” embroidery that was popular at the turn of last century, it’s a beautiful example of needlepainting in silk. 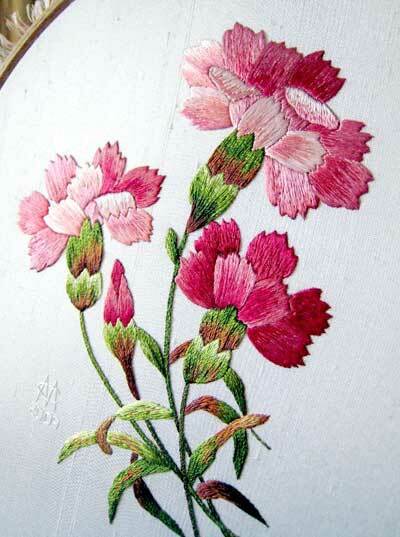 Margaret embroidered these carnations using Eterna silk, both the stranded (flat) silk and the mini twist. The flower petals are worked in the flat silk, and the stems and leaves are worked in the mini twist. The piece is embroidered on an ivory shantung, with four shades of green, four shades of brown, and six shades of pink. The browns and greens are mini twist, while the pinks are flat. When viewed from the side, you can see the difference between the flat silk on the petals and the mini twist on the stems and leaves. I love the shading in this piece. The contrast with the browns and greens in the stems and leaves is gorgeous, isn’t it? I think what I like best about the design is the “natural” look of the bunch of flowers – I prefer this look to many stylized flower designs that are more common today. This natural look to bunches of flowers is typical of many of the “Society Silk” patterns I’ve come across, and I really like the look a lot! Thanks, Margaret, for letting me post the photos! And congratulations on another beautiful finished project! What have you been working on lately with your needle ‘n thread? Any photos you want to share? Feel free to drop me a line and I’ll reply with an e-mail address you can send pictures of your work to! I love seeing what needlework other folks are up to – it helps keep the creative juices flowing! Simply stunning piece of Needlepainting. This is really lovely. Beautiful work Margaret. OH, I just must be in heaven! I cannot believe I have only recently found this website. In following the "society silk" link, I love the treasure trove of designs there. I have a smattering of them from my years of collecting "stuff", but to have a forum for it all is very exciting. Regarding "Art Silk" threads, I remember reading that it is not always 100% silk fibers, but rayon as well. There was some method that the manufacturer could fluff up all the fibers and "fill" the silk fibers with rayon. That could explain some of the excessive shine! In any event, HURRAY for surface stitching!! Hi Mary, what can I say?? Thank you to Margaret for sharing her project with us; and thank you Mary for adding it to your blog. It's Saturday here in New Zealand, and for the first time in 3 months, I have been able to eat Saturday's breakfast at the computer. Such a lovely post to read and to marvel at the delicate shading onthe petals and leaves. I attended the AGM of my Guild on Thursday night and was asked if I should like to be on the Committee for 2010 and I agreed. So I am looking forward to being part of organising the celebrations for the 50th Anniversary in 2011. Hi, All! I'm glad you think this piece is as beautiful as I think it is! And you would never believe how quickly Margaret worked it – she started it, and the next thing I knew, I was looking at the finished piece! Mbellish – you're right – "art silk" that is sold today is a combination of silk and viscose, and sometimes, it doesn't even have silk in it. The silk used 100 years ago, though – featured in that link on Society Silk goodies I received from Freda – we actually 100% silk. It's filament silk, so very shiny, and has just a slight twist to it. Nice stuff! Marian! Congratulations on the new position in your AGM guild – you're going to be Really Busy with that, I bet! But wow – wouldn't it be fun to plan a big celebratory event around stitching?!?! Best of luck with that! I had a wonderful time making the pattern, choosing the threads and colours and, finally, stitching this piece. I think that the stitching was the easiest part. It was so much fun watching the carnations take shape and seeing how the threads and colours worked together. Projects like this are why I stitch. I really like your needle painted flowers. They are awesome. I wish If I could get my hands on the art of embroidery. You've made a wonderful work!!! Margaret, the carnations are beautiful! I also followed the link to the "society silk" link and have added it to my bookmarks. Such beautiful designs! Thank you Mary for sharing Margret's magnificent work. 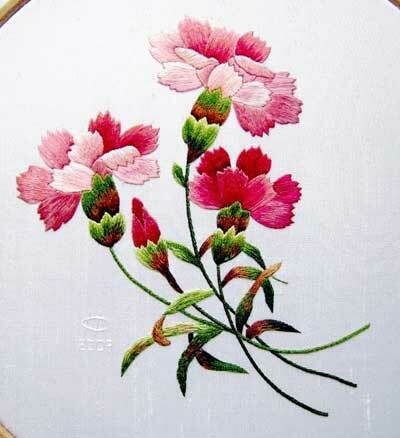 I enjoy your work and articles on all types of embroidery. Alas, since the new website is active, I can no longer see the photographs embedded in the articles. The graphics are tiny. Is there something I need to do to my browser to see them in a larger size again? Hi, Joan – I just sent you an e-mail. Thanks for notifying me of this! Merci à vous de nous faire découvrir ces merveilles. I love the colors of the Spartan Iris that Margaret Cobleigh did. I ordered the kit but not the same colors, boo hoo. Is there a color list that Margaret has and of course, any hints on Trish kits? Did she use other threads than the DMC? Previous Previous post: The Textile Turkey – Happy Thanksgiving! Next Next post: Time for Needlework! Needlebook Progress!